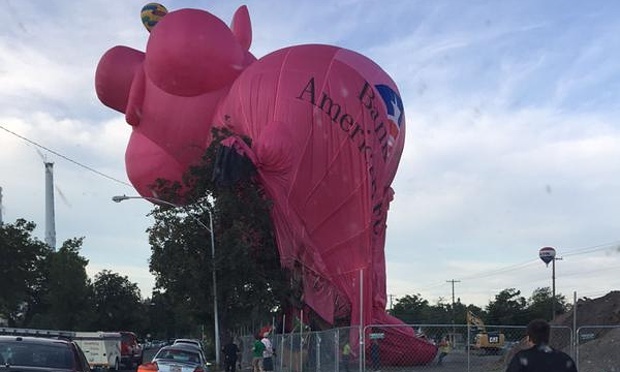 A pig-shaped hot air balloon crashed into a tree and caught fire at a balloon festival in Utah, cutting the pilot’s face. Paul Warner, a festival executive, said the licensed pilot of the fallen balloon also suffered minor facial burns. He was treated at the scene and released. Various balloons entered in the festival were rising at a field near downtown Provo when the top of the pig crashed into the basket of a cowboy balloon. The collision ripped a hole in the nylon fabric of the pig balloon and a piece of plastic caught fire as it descended. The fire was not extensive, said Christopher Liechty, a spokesman for Bank of American Fork, which sponsored the balloon representing Seymour, its piggy bank mascot. The pilot, Erwin Oertli, was the only person in the balloon and suffered minor burns from melted plastic that dripped on to his face, the bank said in a statement. “What saved my bacon was that the head of the pig held a lot of hot air and helped the balloon to descend at a safer rate,” Oertli said.